Avoid the tendency to examine only the feet. Check the spine, upper limbs for evidence of neurological disease or arthritis, proximal limb alignment and joints. Foot and ankle surgeons need to be amateur neurologists! Look at the patient's shoes - could this foot fit in this shoe? Frey found that American women wore shoes 1cm narrower than their shoes. Same in Blackburn! 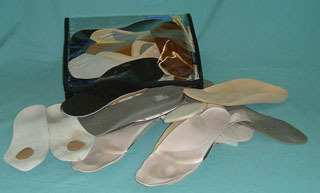 We ask patients to bring all orthotics with them - it give you an idea what has been tried and what modifications might be made. Sometimes orthotics are fine but don't fit. Feel for tenderness over deformities, around metatarsal heads and MTP joints. 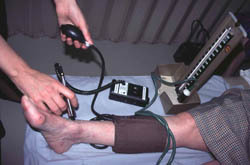 Details of assessment of deformity and movement of a hammer second toe. There is a hyperextension deformity of the MTP joint and a flexion deformity of the PIP joint. 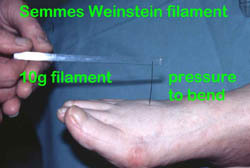 In this case the DIP joint is straight - in some hammertoes it is extended. Check the stability of the MTP joint using the Thompson-Hamilton draw test. 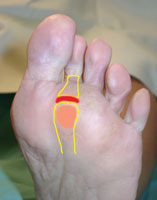 Hold the metatarsal in one hand and the proximal phalanx of the toe in the other. Thompson and Hamilton performed the test with the toe in neutral dorsiflexion/plantarflexion; we find slight plantarflexion helpful if the long flexor tendon is tight.